After getting reminded about appointments, your clients easily confirm appointments by text message or email. 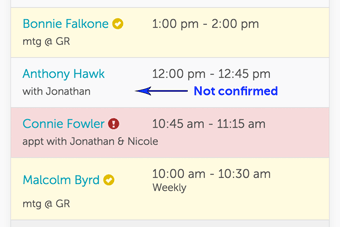 Your confirmed appointments automatically show with a check mark in GoReminders. Customers and clients love receiving appointment confirmation text messages. They’re impressed that you thought ahead to take care of confirming client appointments. When they get the reminder, they reply to send text confirmations for appointments ("reply C to confirm"). For email reminders, the appointment confirmation email template has a button to click to confirm the appointment. 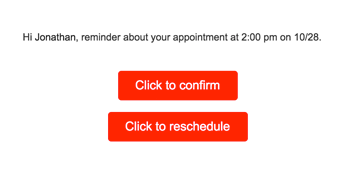 If you have appointments to confirm with customers for any kind of visit or event, you can customize the appt reminder template to fit your needs. Our appointment scheduling software is the easiest way to get clients to confirm their appointments. An automated system is the best of all methods used when confirming appointments. 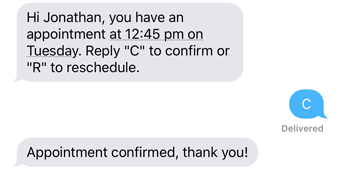 The appointment confirmation emails have built-in appointment confirmation wording for text reminders for appointments — your friendly appointment reminder template will be professional and helpful. When you have the Confirmations feature enabled, GoReminders automatically adds "Reply C to confirm or R to reschedule" (rescheduling is optional) at the end of the text reminder message. In the email reminder message there will be a “Confirm” button and “Reschedule” button. The appt confirmations work seamlessly with our recurring appointment reminders so your customer will be asked to confirm every time you have a repeating appointment. You can ask for confirmations in any language because we support multilingual appointment reminders. If your client confirms the appointment when they get the first reminder, they won’t get prompted to double-confirm again. The automatic "Reply C to confirm..." message and Confirm/Reschedule buttons do not get added to the second and third reminder messages if the client already confirmed. You can also set the status of the appointment to “Confirmed” from within GoReminders if your client calls you to confirm the appointment. Your confirmed appointments automatically show with a check mark in our calendar reminders app. When people confirm or want to reschedule an appointment, we'll send you an appt confirmation email or text message to your cell phone — whichever you want. You're always in the loop on who has confirmed appointments and who requested to reschedule or cancel, saving you time and avoiding downtime at the last minute due to appointment no-shows. "I like knowing in advance when my clients can't make their appointments, which gives me time to schedule someone else in their place!" "The thing that I love love love is how there is an option for the individual staff members to each receive confirmations to their own phone/email. I know that we have found real value in your services and next month we are going to change our membership to yearly." "I really like that clients can confirm an appointment or indicate that they need to reschedule via SMS message reply!"